A battle over conformity is brewing in Shavano Ridge - and in many American suburbs. At 3:30 in the morning, Bill Beverly, a trim man with a back as straight as a flagpole, runs three miles through his Shavano Ridge subdivision, patroling the neighborhood for strangers, unfamiliar cars, and teenage pranksters. Architectural Control Committee. "We're trying to preserve the neighborhood. We don't want to live with bars on the windows. We have to compete with more expensive neighborhoods. We have to keep our guard up." and individuality - by the Homeowners' Association Board and the Architectural Control Committee, whose members stroll the neighborhood looking for violators. These complaints aren't limited to Shavano Ridge: Although a 1999 Gallup poll showed that 75% of residents surveyed said they were "very satisfied" with their subdivisions, many residents in planned communities claim their homeowners' associations have become fiefdoms. Some HOAs, critics say, use the pretense of maintaining property values to justify arbitrarily threatening and suing residents for real or imaginary infractions, even foreclosing on their homes, in some cases. HOAs are backed by the Community Associations Institute, a national trade and lobbying group that oversees master-planned communities. Within their subdivisions, HOAs carry the authority of governments but bear little of the accountability. Consequently, these power plays are transforming suburban America - home to 50 million people in 250,000 planned communities - into a lifestyle more Orwellian than Utopian. Dorian and Mary MacDougall moved to San Antonio from Los Angeles in 1994. To live close to the University of Texas Health Science Center, where Mary MacDougall works, they purchased a 3,200-square-foot house in Shavano Ridge, a Centex development off DeZavala Road. At the closing, MacDougall noted that the house came with Centex's "Covenants, Conditions, and Restrictions," rules that dictate how a home can be modified. They are common in condominiums and cooperatives where residents share walls, but, MacDougall says, "I had never seen them on single-family homes." The Centex salesman reportedly reassured the MacDougalls the CC&Rs were minor. "He said, 'It's nothing. Don't worry about it. It's just if you want to make any additions you have to get permission,'" Dorian MacDougall recalls. of his red brick house with the color Palomino - a shade of pale orange, akin to sherbet. nor was the color he chose approved for Shavano Ridge. He was given a year to repaint, although in February 2001 he received a two-year extension. house is in a cul-de-sac in the corner," says Bill Beverly. "I had residents calling saying that they had either heard of or had seen the orange house." In January 2003, 11 months before the repainting deadline, MacDougall received another letter from Association Management Services, threatening to sue him if he did not repaint in 30 days. But in February, the HOA reversed itself, and MacDougall received another letter rescinding the lawsuit. In December 2003, the MacDougalls presented to the ACC additional color choices including Roasted Cashew, Indian Peach, Light Topaz, Palomino, and Sweet Potato. All were rejected because, the ACC ruled, homes must be painted in the "color of the original building scheme or any Shavano Ridge home which was the original paint color of the the original contractor." was all they could say." Centex Design Center confirmed that there are no - and never have been - standard colors for Shavano Ridge. "Even if we did have a standard list, they would have changed anyway. Many colors are discontinued," says Centex's Truth Camino. Although the Community Association Institute recommends that HOA boards keep a book of paint samples and brands, Shavano Ridge has none. Without any guidelines, the MacDougalls submitted more colors to the ACC: Stucco, Gothic Tan, Autumn Morn, Kiva Glow, and Pale Copper. The ACC approved three, with the caveat that it would still have to OK the final color. In January, the MacDougalls painted their home Autumn Morn. "He repainted," Beverly says, "and the paint just got darker. It's still orange. But he abided by rules." At the heart of this four-year dispute, Beverly says, is that the MacDougalls didn't adhere to the CC&R clause stating that no alteration can be made to a building without ACC approval, although the clause doesn't specify paint. The same lawyer whom the board later fired decided that repainting was an alteration included in the CC&Rs. "You can make, or you even have a duty to, make him repaint," reads a letter from the attorney to the board. After Stone Oak resident Richard Craig received notice that his homeowners' association would foreclose on his house for not paying his $60 in late homeowners' dues, his problems didn't stop there. He wanted to put vinyl siding on his house to cover the stucco and rotting wood, and hired a company that had toured the neighborhood looking for customers. The company received permission from one of the homeowners' associations, but since there are several governing the neighborhood, the one that didn't approve of the siding sued him for not complying with the development's Covenants, Conditions, and Restrictions - rules Craig says the title company downplayed at the house's closing. "They said, 'That's nothing. It's like any deed restriction you have seen before. It was the biggest lie I had ever been told." The title company later went out of business. Craig says he wasn't notified he was out of compliance before a process server - a law enforcement officer that serves lawsuits - came to his door. Craig countersued, and after 18 months of litigation, he won $12,000 from the HOA's insurance company, which barely dented the $40,000 in legal fees that he had accumulated, and the cost of removing some of the siding and renovating the house. "I was financially devastated," says Craig. Ironically, ProComm, the management company that works with Craig's HOA, is headed by State Senator John Carona, whom the Community Association Institute called "a very good friend of our industry." "In Ashland, Massachusetts, a Vietnam War veteran was told that he could not fly the American flag on Flag Day. The board backed down only after the resident called the press and the story appeared on the front page of a local newspaper. In Monroe, New Jersey, an HOA took a married couple to court because the wife, at age 45, was three years younger than the association's age minimum for residency. The association won in court, and the judge ordered the 60-year-old husband to sell, rent the unit, or live without his wife. In Houston, Texas, an HOA took a woman to court for keeping a dog in violation of the rules of her development. The association won, but she kept the dog anyway. The judge sent her to jail for contempt of court. Furthermore, Beverly points out that the CC&Rs allow the board to "interpret" the deed restrictions provided by the developer, giving it and the ACC wide berth in determining what is appropriate for Shavano Ridge. "This is selective enforcement to go after certain people," says MacDougall, who spent $2,000 to repaint his home. "I still don't know what the Shavano Ridge paint scheme is." On a tour of Shavano Ridge one afternoon, a house on the corner stands out. The resident has defiantly jammed a pink flamingo in front of a bush. Another resident has installed vents in his garage door; neighbors complain they are ugly. One home has navy blue shutters; neighbors think they're inappropriate. "People move here knowing there are CC&Rs," Beverly says. "We're just trying to get people to do the right thing. Lots of problems are resolved without letters." In a cul-de-sac, Beverly gazes at a house where the owner buried several dead kittens in his front yard, then posted a small cross on the gravesite. Neighbors called Beverly to gripe that the cross was "tacky and ugly," and that it must be "illegal to have a cemetery in your front yard." The board intervened; the homeowner removed the cross, but laid it on the grave. "If we didn't have CC&Rs, there's no way to get them to remove it," MacDougall says. Beverly contends the board is flexible, allowing homeowners to use composite material to replace siding and to install iron gates. But some residents see this "flexibility" as an arbitrary application of the rules. For example, at Pat Roberts' house, a small, collapsable trailer covered with a clean, gray tarp is almost hidden behind a newer model truck. Across the street, four cars with dirty, light blue tarps sit in the driveway. The Roberts have received at least three letters citing them for the trailer, which according to the CC&Rs, is illegal to have in view from the street. "The Roberts say the trailer is less visually disturbing," Beverly says. "But he [the car owner] is following the covenants. The Roberts just need to build a picket fence to hide their trailer." Roberts says she plans to build the fence, "although frankly, I can't afford it. "Some people are allowed to do things," she notes, adding that a man down the street was scolded for using six-inch boards on his fence instead of four-inch boards. "We have retired military here who think it's a military base and think it should look like one - bland." Before moving to San Antonio, Roberts lived near Waco in a subdivision without an HOA. "I had the first house with yellow trim," she recalls. "The subdivision looked fine. Everyone kept their house neat and tidy." Shavano Ridge resident Ken Tackett also has clashed with the board and the ACC. He says that after he installed solar panels on the back of his house to heat his swimming pool, the board threatened to put a lien on his property if he didn't remove them. The board later backed down. When Tackett repainted his garage using the house's original color of paint from the original can (although it was several years old), an ACC member told him the color wasn't appropriate and didn't match, and demanded to know when it would be repainted. "Personally, they've taken it too far from the purpose of keeping the neighborhood in decent shape and keeping people from parking cars in their front yard. "It's not like this everywhere," Tackett adds. His parents, who have freely repainted their home, live in the High Country subdivision, he says, and "no one has fussed in 25 years. The subdivision looks as good as new." Homebuyers who purchase in planned communities automatically become HOA members, pay dues, and must abide by the CC&Rs. For Centex or any builder to include CC&Rs in its developments and for a board to charge homeowners' dues, the community must have common areas such as swimming pools, tennis courts, or clubhouses. At Shavano Ridge, $132 a year buys a common area that is merely a median at the subdivision entrance and a few strips of grass. The dues also pay for other services, including directories, board members' insurance, and legal fees. "You're paying dues to sue yourself," says MacDougall. From six months to one year after Centex closed on the last home, it left the subdivision's management to an HOA, whose board is charged with enforcing the CC&Rs and permanently maintaining the conformity and harmony of the subdivision. The CC&Rs, says James Espinar of Centex, "keep up the aesthetic and property values. We keep things as simple as possible: neutral, standard, with a vision of how the development would materialize." "Pretty strange things happen even in middle-class neighborhoods," says Beverly, referring to a Muslim family that had goats and chickens in the back yard. "We're seeing neighbors doing things that have never been done before." Shavano Ridge HOA board members are elected to three-year terms, but many have served for a decade. "We can't get anyone to run," says Beverly, citing the board's extensive duties, including organizing welcome packets, monitoring groundskeepers, organizing events, and filing "decision paper," that show the board's rationale on their rulings. "We cajole people to run. Not our people, any people. The only reason I stay is the board needs institutional memory." Beverly maintains that the HOA board and ACC are a "democratic organization, no different from Congress. We attempt to represent the community." But it could be argued that the board, while functioning as a quasi-government, isn't democratic. First, it simultaneously occupies the legislative, judicial, and executive branches without oversight. Secondly, the elections are suspect. Since so few people vote (or even attend the monthly meetings), the board issues proxies. A resident receives a ballot and either fills in their candidate's name or leaves it blank. If the resident doesn't name a candidate, the block captain can take the proxy and vote for whomever he or she wants. "Residents often don't know who these candidates are and say, 'Vote for me,'" Beverly says. "Silence is consent." CAI: Whose side is it on? The Community Associations Institute started in 1973 as an educational resource for homeowners associations, whose numbers increased as demand grew for suburban housing. "We exist to promote harmony and reduce conflict in associations," says Frank Rathbun, CAI media spokesperson. "The biggest challenge in HOAs is related to balancing the right of the homeowner with the best interests of the community as a whole." But critics, including attorney Evan McKenzie, author of Privatopia, contend the CAI has transformed into a lobbying organization for its membership: HOAs, real estate groups, builders, attorneys, and management companies, many of whom profit from the disputes between HOAs and residents. The CAI's Legislative Action Committee pushes for laws favorable to its well-moneyed members. In Texas, Connie Heyer is the lead lobbyist, with retired Senator Buster Brown and Association Management Services' Barbara Lowry as part of the lobbying team. In Heyer's report on the 78th legislature, she wrote: "Not one bill that adversely affects homeowners' associations or their members passed. The CAI successfully amended bills or worked toward killing bills that could have been harmful to our industry." Those killed bills included HB 1641, which would have required HOAs to send violations in English and Spanish. It would have subjected HOAs to the Open Meetings Act, which the CAI characterized as "a complicated set of government regulations." The CAI also shot down SB 949, saying it would have been "most harmful" and "given members unlimited access to records for any purpose including harassing volunteer board members or board managers." Rob Edwards, legislative aide to State Senator Jon Lindsay, who authored SB 949, argues the measure would have "leveled the playing field for homeowners." One of the bill's provisions would have prohibited HOAs from filing liens and foreclosing on homes without a judge. That happened to Houston resident Winona Blevins, who inspired the bill. Her HOA foreclosed on her home for $800 in late homeowners' dues, then sold it and evicted her. She sued, got back her home, plus $300,000 in damages. 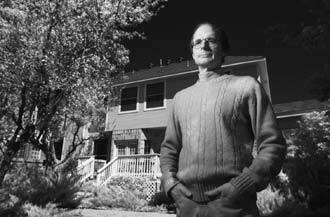 In San Antonio, Stone Oak resident Richard Craig owed $60 in dues and another $30 in late fees when his homeowner association threatened to put a lien on his home. "It was extortion," he says. "I was livid. But I said, 'Let's pay this.'" "HOAs can do that," Edwards says. "They're driven by a cottage industry of management companies and attorneys, who will be hurt if the law changes." Instead of solving problems neighbor-to-neighbor, some Shavano Ridge residents use the HOA to do their dirty work. "That's why we have to have an HOA, so people don't have to get into confrontations with neighbors," says Beverly. "Change is a pageant of inspiration, a sideshow of possiblities, a freak show of dreams." Ironically, Shavano Ridge's common area has developed in cyberspace. MacDougall's website (http://home.satx.rr.com/usrw) logs opinions on the HOA issue, ranging from pro-board sentiments lauding members for their hard work, to anti-MacDougall comments - "You stick out like a sore thumb!" typed in all capital letters - to anti-HOA comments: "Board members wish to impose an ugly conformity on the rest of us. There are too many petty-minded busy bodies who seem to have too much time on their hands." Beverly has placed the CC&Rs on the Shavano Ridge site, (www.neighborhoodlink.com/sat/shavano), but hasn't opened a chatroom. "I've been advised not to," he says. "It creates dissent and problems. They can voice complaints by coming to us in a respectful manner."